The North Face and Osprey companies produce highly popular backpacks for backpacking and travelling. The Farpoint 40 and the Overhaul 40 allow users to take their travels into the woods, as well as on airplanes. These backpacks are fairly similar in volume capacity, but have some significant differences to take into account. We have written this review in order to better inform potential customers about these differences so that they can make a better, informed decision as to what is best for them. Before we get into what we consider to be the unique features for both of these backpacks, let’s go over some of the commonalities that they have between each other. One of the reasons why people tend to compare the Farpoint 40 and the Overhaul 40 is that they have a few key similarities. Keep in mind that they are also very different backpacks. Before we begin to compare them, below is a list of what makes them comparable to each other. Both can be used as carry-ons: For most airlines, the Farpoint 40 and the Overhaul 40 are below the size limit for a carry on. Most do not have any issues with either of these backpacks while travelling by airplane. Can be used for camping: Osprey and The North Face have been pretty good at amalgamating camping type backpacks was travelling backpacks. Since many travellers also do you like camping and vice versa, it is only practical to have a backpack that will allow you to do both. But even if you do not go camping or travelling, these backpacks can effectively be used for your daily commutes. Both come with a laptop and tablet sleeve: In case you want to carry your tablet and laptop with you, both of these backpacks include separate compartments for each of these. Keep in mind that not all sleeves are created equal, as we will be covering in the next section. Hip belt: Both have hip belts, but are designed in different ways with different levels of comfort, as will be covered below. Tall and slender design: There are more stylish than most backpacks that can be found in retail stores. They are long and slender, while still providing plenty of room for gear. 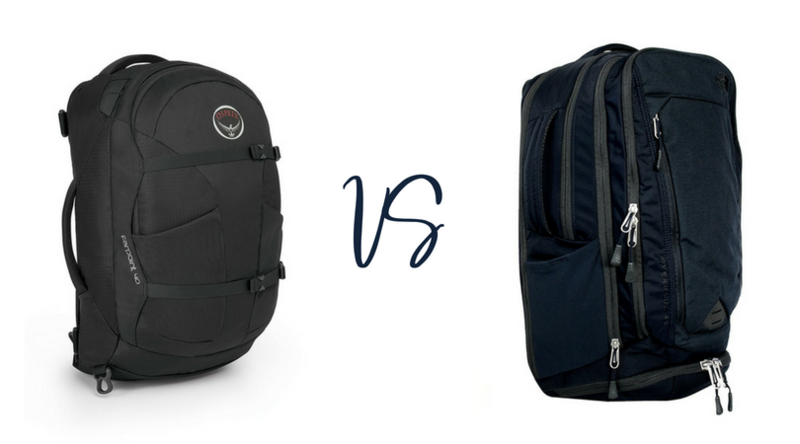 In order to further illustrate how these backpacks stuck up against each other, let us go over the most important differences between them so that you can make a decision as to which would be best for you. Warranty: The Osprey company has the best warranty standards. The offer excellent coverage and customer service in case there are any defects over the long run in your backpack. Utility and comfort: Out of utility and comfort, which do you feel is most important to you? The Farpoint 40 is the simplest of the two backpacks. It does not have nearly the amount of pockets that the Overhaul 40 has. The Farpoint 40 is very simple, yet ultra-comfortable compared to the Overhaul 40. Backpanel, shoulder straps, and hip belt: Out of these two backpacks, the comfort level of the Farpoint 40 is unmatched. It has plenty of padding on the backpanel, and wide shoulder straps. It also has a padded hip belt. In contrast, the Overhaul 40 has a thin hip belt and then padding on the backpanel. This means that you will not be able to carry large loads for long periods of time as you would with the Farpoint 40. Placing of the laptop and tablet sleeves: This is an important difference that cannot be ignored. The Farpoint 40’s laptop and tablet sleeve is placed on the opposite side of the backpanel. This creates an awkward distribution of weight when carrying your electronics. We are not certain as to why it is designed in this way. In any case, the laptop and tablet sleeves in the Overhaul 40 are nicely placed against the back, and provide plenty of padding. This backpack is one of the best for carrying a 15 inch laptop. Thickness of material: The durability of these backpacks will highly depend on the thickness of the materials used. While the Farpoint 40 uses a 210D nylon, the Overhaul 40 is made of a 420D ripstop nylon. Neither one of these materials is super thick, but they don’t need to be for most uses. The thicker Overhaul 40 material will lend itself very well to making it last longer. Dimensions and weight: There is only a slight difference in these specifications for both of these backpacks. The Farpoint 40 measures 21″x14″x9″ and weighs 3.2lb. The Overhaul 40 measures 21″x12″x7″ and weighs 3.2lb. Organizational pockets: And last but not least, you must make mention of the sweet organizational features of the Overhaul 40. Its entire front panel pocket is made up of small compartments that are designed to hold specific items. It has four cell phone sized pockets, a larger zippered pocket, and some pen holders. It also has a nice side pocket that you can reach for without taking off a backpack. And finally, the Overhaul 40 has a zippered compartment on the underside of the backpack for dirty clothing or shoes! Osprey and The North Face offer popular cult favourite backpacks that stand the test of time, and for good reason. Out of the backpacks above, deciding between them is a matter of personal preference. For instance, you mentioned that the Farpoint 40 is more comfortable while carrying large loads for long periods of time. However, it has a very simple pocket layout. In contrast, the Overhaul 40 has plenty of organizational pockets. It is also made of a more durable material than the Farpoint 40. The decision to make can be a difficult one, but it can also be an easy one if you know exactly which features suit you the best. Let us in on your personal preference… Please let us know where you stand between the Farpoint 40 and the Overhaul 40 by leaving a comment below!